Sources at the Lanka Private Bus Owners’ Association (LPBOA) have announced that a prepaid card system will be introduced to private bus services in a majority of the provinces from 1 April 2017 onwards. 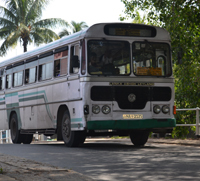 According to LPBOA President Gemunu Wijeratne, the system will be implemented on certain bus routes in the Western and Central Provinces from early 2017. The government is also said to be supportive of this proposed system, which will be implemented together with the Information and Communication Technology Agency (ICTA) of Sri Lanka. A sum of Rs. 100 will be credited to the accounts of bus drivers and conductors daily, and they would also be provided with a pension.